Abq Jew Palooza! The Jewish Federation of New Mexico and Congregation Albert are pleased to announce the first ever New Mexico Synagogue Musicians Shabbaton. This extraordinary learning event is open to those involved with leading the music of worship for their congregation or community; soloists, choirs, bands, Rabbis, Cantors – everyone who leads! Yes, this is Abq Jew Palooza! Event Number 2. No, Abq Jew has not forgotten Event Number 1. He simply wanted to be sure you plan for Event Number 2 well in advance! The Shabbaton will include many exciting learning opportunities in a variety of learning venues featuring the visiting scholar for this event, Cantor Ellen Dreskin, the Coordinator of the Cantorial Certification Program of Hebrew Union College - Jewish Institute of Religion - Debbie Friedman School of Sacred Music. The theme for the Shabbaton is Manginot v’Manhigut (Music and Leadership); Jewish Musical Mentorship and the Responsibility of Liturgical Leadership. The schedule includes Erev Shabbat Service at 6:00 pm at Congregation Albert that will be a combined service of Congregations Albert, B’nai Israel, and Nahalat Shalom. This worship service will feature the combined bands and choirs of these congregations. Our scholar, Cantor Dreskin, will give a D'var Torah and teach with music. Registered Shabbaton participants will enjoy Shabbat dinner, Z’mirot and learning following services. The schedule continues on Shabbat morning with Torah study and Shabbat Morning Services, once again featuring Cantor Dreskin, who will leyn and give a D'var Torah. Registered Shabbaton participants will enjoy lunch and an afternoon of learning, concluding with a Seudah Sh’lisheet followed by Havdalah. And what to do Thursday night? Motzei Shabbat? Sunday night? 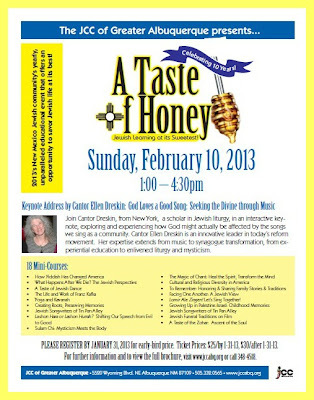 And don't forget A Taste of Honey! 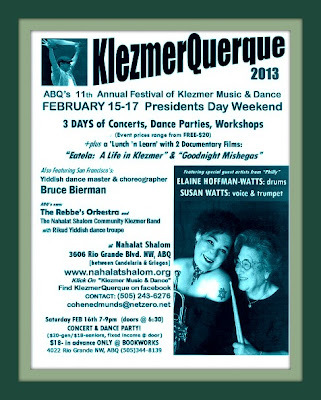 And the week after that - it's KlezmerQuerque 2013! who passed away earlier this week. See also Boogie Woogie.